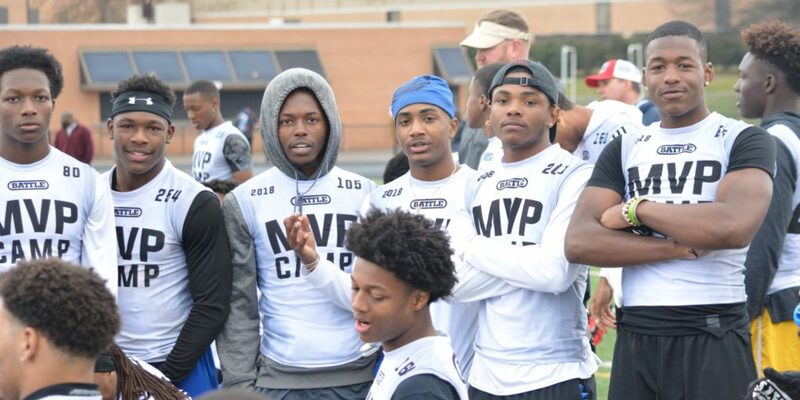 Roughly 350 athletes of some of the best emerging football talent in Georgia converged on Twelve Oaks Stadium at the campus of Lovejoy High School for the annual MVP Camp, put on by 247sports.com recruiting analyst Rusty Mansell Sunday. The rain didn’t stop athletes from across Georgia, and even other parts of the Southeast, from showing their chops and benefiting from coaching as many of these players are trying to find their way onto recruiting radars as we inch closer to spring football and summer 7-v-7s. Obviously, I couldn’t lay my eyes on everyone, but here are a few notable performers that caught my attention. Tyrek Presley, Jr., Drew (Riverdale) As Presley was celebrating his being named the MVP Camp’s Top Performer, the 6-3, 185-pound wideout lifted his shirt to display a Georgia Tech t-shirt underneath. That’s because Presley, though currently without offers, says that Tech is the school that’s been showing him the most love. If anybody was able to witness his performance Sunday — or for that matter, his junior season at Drew — that “no offers” thing should change in a hurry. On Sunday at Lovejoy, Presley showed off much of the form that helped him to a team-leading 643 receiving yards on 34 catches with three scores. But even more impressive was the way Presley unpacked the cerebral part of the game as he soaked in the coaching he was getting at the MVP Camp. Presley will also be at The Opening on March 25. And it’s probably safe to say that the rising senior won’t be offer-less for long. WR Lawrence Shadd, III, Jr., Harrison (Kennesaw) Shadd is a 6-1, 190-pound wideout who, beyond his physical attributes, showed himself to be a feisty competitor. Shadd consistently showed the speed to out run coverage and on several one-on-one drills he ran crisp routes and flashed the ability to make grabs even under duress. On one of his earliest catches, Shadd went up for the ball, caught it and maintained possession in the end zone while a defender was draped on his back. Last year Shadd benefited from a Justin Fields-ran offense. But he also built chemistry with class of 2020 quarterback Gavin Hall who played several games when the nation’s top 2018 quarterback prospect, and now UGA freshman, was injured. Justin Fomby, Jr., Brookwood (Snellville) Brookwood seems to have a thing for producing talented 6-foot-5 QBs. Last year it was 6-5 senior Angelo Dispigna under center, leading Brookwood to an 11-3 record and 6-0 mark in region play. This year, the mantle could very well fall upon Fomby. 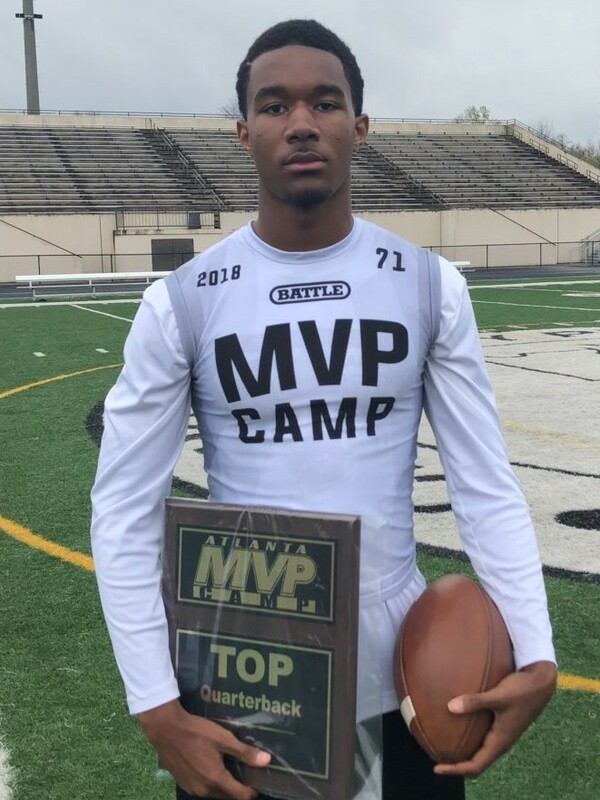 The 6-5, 190-pound signal caller took home the MVP Camp’s top quarterback award after consistently showing off a big arm and enviable passing touch. When you watch film on Fomby, you see that, despite being a guy who looks to throw first, Fomby can tuck and run. He’s also a solid passer while moving the pocket on rollouts. While there were several more-than-solid quarterbacks in Sunday’s camp — including Cartersville rising junior Tee Webb — Fomby stood out. Jacob Pierce, Jr., Veterans (Kathleen) The biggest things that stood out for the 6-1, 175-pounder is his toughness and tenacity, and his nose for the ball. Pierce has good speed, but he’s even better in the “scrappy” department. When on an island, he showed a knack for being able to locate the ball, and during his MVP Camp time, he rarely — if ever — “positioned” himself out of being able to make a play. Pierce wasn’t named top DB by a fluke. The kid can play, and should help vastly improve a young Veterans squad that had a roster rife with sophomores. Dejuan Brown, Jr., Newton (Covington) An extremely talented Newton squad perhaps played beneath its potential in 2017 due to several key players lost by injury. More key contributors — particularly in the defensive secondary — will be lost to graduation. But Brown is one of those guys who looks primed to step up into a starting role at corner. Brown had just 13 tackles in limited duty as a junior, but Brown made some spectacular plays during the MVP Camp, including one in particular where he got good position on a wideout and blanketed his route before coming up with the pick. Newton assistant coach Josh Skelton expects Brown to have a breakout season in 2018. Kaleb Chatmon, Jr., Cartersville At 6-0, 170 pounds, Chatmon showed himself to be a fairly fluid wideout at times during one-on-one battles in Sunday’s camp. The second leading returning receiver for the Purple Hurricanes will look to build chemistry with rising junior quarterback Tee Webb, the probable heir apparent to the Cartersville offense after the graduation of Trevor Lawrence. Webb also caught eyes and was named to the All Camp team for his quarterback play Sunday. Adarius Thomas, Jr., Newton If he had the size to match his work ethic, every college football blue blood program in the Southeast would know his name. Be that as it may, Thomas may be one of the most versatile “sleeper” tailbacks in Georgia. He showed off his pass-catching ability, Sunday, as well as some solid route running. Perhaps generously listed at 5-9, 175 pounds he’s stronger and more physical than he looks. In 2017 he rushed for 540 yards and four scores, caught 19 passes for 382 yards and four receiving TDs, and was fifth on the Rams’ squad in all-purpose yards. His coming-out party, perhaps, happened in Newton’s overtime playoff loss to Parkview. In that game, Thomas rushed for 161 yards on 31 carries with two touchdowns, while snagging three balls for 50 yards, proving he could be an every-down back. Thomas is looking forward to attending Nike Football’s The Opening on March 25 at Buford High School. Nick Price, Fr., Sandy Creek (Tyrone) Sandy Creek football began a new era with new leadership following the departure of long-time coach Chip Walker who left after the 2016 season to take the Newnan job. That means second-year Patriots coach Brett Garvin is still on the hunt for emerging talent. In Price, he may have something. As a freshman in 2017, Price played in just one game where he caught three passes for 35 yards. But Sunday at Lovejoy, he showed good competitiveness and made a couple of nice grabs. He could be a player to earmark, heading into his sophomore season.